Log Office Design – Which design should you go for? 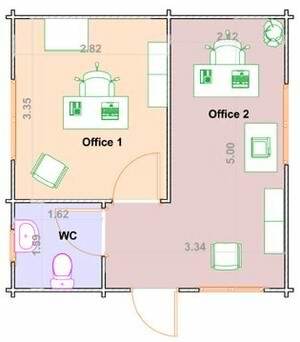 Log office design is affected by basic log design principles, but an office also needs planning carefully, if it is going to function efficiently. Whilst there is a certain amount of overlap here with the “log office use” page, there are other aspects we would like to explore in more depth here. The overall shape, roof structure, rooms, aspect and windows and doors all need looking at further. The overall shape of your log office design has some significant affects. Firstly squarer shapes tend to be cheaper, on the basis that the external wall and roof area is less per unit floor area, than that of a long, thin design. The more regular a shape is too, will help to minimize costs, hence a lot of log office designs are basic squares or rectangle. While abutments add a lot of extra character and appeal to a log cabin, their extra cost per unit floor area, is always going to be higher. In terms of cost then, simple designs always work out cheaper. However there are other factors regarding the overall shape or foot print of your office. You may be constrained by the physical site or need an irregular shape to meet a certain need for the office. If you want to have a separate room at one end of the office, then and longer rectangle may then provide a nice square office area in the resultant section. Get some paper and play around with some designs. Better yet go and look round some example log offices and see how they suit your needs. 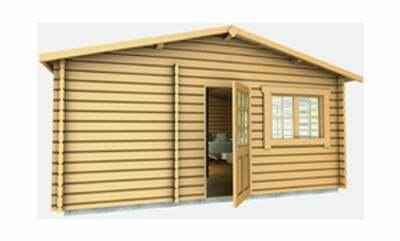 An off the peg regular log office design will be cheaper, but if you really need a custom or bespoke design, there are companies out there who can do this. 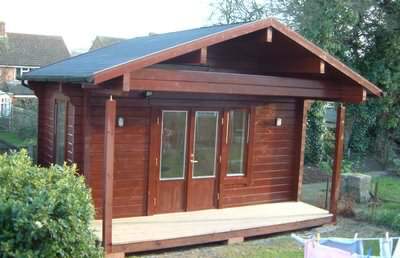 Whilst many people don’t tend to think about the roof of a log office design, it can be an area that could be used to your advantage. Most offices will come with a flat ceiling, because it is normally the cheapest way to construct a roof. However by using different types of roof design, it is possible to use often wasted space! The ceiling could be vaulted to create and much more impressive look and make the office feel bigger and more airy. Alternatively some or part of the roof area could be used as useful storage space. Providing the roof is high enough, by using the right roof trusses (or other less obtrusive roof structures), a good useable space can be created. Although there may be some additional cost to this, it would certainly be cheaper than increasing the floor area! Internal walls will increase the cost of an office, but they can also be essential for larger offices where several people work together. Again it depends on how much interaction is needed between users and whether any activities one person will undertake, will disrupt others. This is a balance you have to weigh up, (where the office will be used by more than one person). Remember this though, with a log structure all the logs form an integral part of the structure and interlock with each other. It is therefore not possible to add a log wall internally after the build. You could add a timber stud partition (using correct settlement techniques), and give similar look using log profile boarding. However this is not something you could pick up at your local DIY store and it would have to machined especially or possibly sourced through your log office supplier. It pays to do your homework first and get it right from the start! The direction your log office faces could affect some parts of your log office design. How is this? Well the orientation to the sun, does have a large impact. Unfortunately when we built our current office 10 years ago, we had too much glass facing south. Whilst natural light is great it created 2 main problems for us. Firstly when it is sunny it can get very hot and secondly all the glare from sun can create problems when trying to look at a computer screen. Although air conditioning and window blinds have mitigated this to an extent, we would not have used the same log office design, given a second chance. We put too much priority on the view out of the office and not enough of the practicality of dealing with the potential problems the sun could cause. Learn from our mistakes and think about the way your log office faces, before deciding your best log office design. This can also link to the aspect of your office (as previously discussed), but there are also other factors at play here. Too few windows and doors can create a darker and less appealing working environment. Too many though can also eat into valuable wall space. You can’t (or wouldn’t normally anyway) cover a window or door over, so lots of windows looks great, but can restrict internal options. Especially where you need tall furniture or equipment, you must think about how much walls space you will require. As with all these things, it is getting the balance right. Spend plenty of time planning this out first and the size, location and quantity of windows and doors should become apparent.